Brief Specs: Genuine Windows Vista® Home Premium , Intel® Centrino® Duo Processor Technology, Intel® CoreTM 2 Duo T5250, 2 GB RAM, 160 GB HDD, 15.4” Wide Screen TFT, DVD Super Multi Drive, Integrated Camera & Bluetooth, 1 GB Turbo Memory. Microprocessor Processor Model: Intel® CoreTM 2 Duo T5250 Clock Speed (GHz): 1.50 GHz. Pointing Device & Keyboard 87 Keys (Including Functional Keys) + 2 Hot Keys (1 for Wireless LAN ON/OFF and 1 for Power4Gear states); Built-in touch pad with 2 click buttons (For Left & Right Click) operations.. This entry was posted on August 11, 2008 at 6:16 pm	and is filed under HCL Laptop Z23- Z2302. 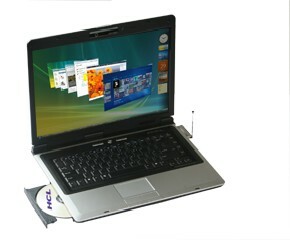 Tagged: HCL Laptop Z23- Z2302. You can follow any responses to this entry through the RSS 2.0 feed. You can leave a response, or trackback from your own site.